Feeding on new growth of Creosote Bush (Larrea tridentata) in Vekol Valley, Sonoran Desert National Monument, Arizona. Aug 10, 2008. Among living creatures the mouth parts of weevils represent the highest degree of design and bioengineering. The beetle at left is merely using her mandibles to chew the leaves of creosote bush. But their true function comes into play as she excavates a site within the plant to lay her eggs. 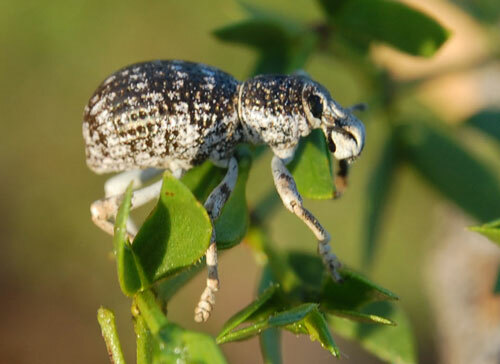 There are tens of thousands of weevil species each with different requirements for their larvae to get a start. In most cases weevil young must tunnel within a stem, bud, fruit or root. The female must get the egg to the proper starting point and she does this with her superb mouth.